Gypsy Theatre Company pleases again, with the wildly funny high quality reproduction of the wildly funny Tony award winning, “sort of sequel” to the Broadway’s smash -hit Boeing-Boeing at the Buford Community Center. Opening night, August 25th we enter the Sylvia Beard Theatre, to be greeted by an open stage and lovely set, both rustic and elegant as a renovated French farm house with a prominent and unusually long couch from 1971. There was no change of set during the show as it was performed in the main living room of the country house somewhere outside of Paris, The design was meticulous in every detail down to the rustic sliding barn door to the piggery and cow shed as married couple; Bernard played by Davin Allen Grindstaff and his wife Jacqueline played by Julie Trammel, affectionately named the 2 guest rooms on each side of the stage complete with, appropriately labeled cow and pig wooden cut outs which I might add, become quite helpful to aid the audience in keeping the revolving bed room assignments straight as the play’s complex relationship statuses continue to change which both confuses and delights the audience. Our story begins with Bernard, who hopes to send his wife, Jacqueline, to her mother’s for the weekend, so that he can be alone with his mistress, Suzanne, a Parisian model, played by Alessandra Scarcia. 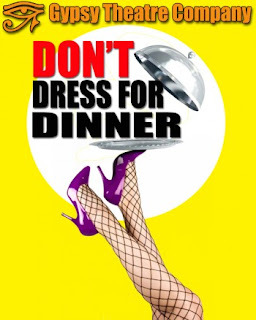 Bernard has hired a Cordon Bleu cook, Suzette, played by Rachael Endrizzi and invited his friend Robert played by Aaron Gotlieb to dinner to be his alibi . Jacqueline cancels her plans to be with “her” Robert after she learns Robert is also spending the weekend. This causes Bernard to panic, and he tells Robert of his affair with Suzanne. who is to arrive at any moment. Bernard begs Robert ,against his will to pretend that “Suzy” is his girlfriend. Bernard and Jacqueline leave to buy groceries, Suzy arrives — but it’s the caterer, not the mistress un-beknownst to Robert who then introduces Suzette as his girlfriend upon the couples return. Bernard is furious because of the mix-up, and Jacqueline feels betrayed thinking she was Robert’s only mistress. Suzanne with a very authentic French accent finally arrives, learns she must now play cook is outraged but, reluctantly agrees to play her part. All in the first 15 minutes of the show. The lies continue to grow, Suzette the cook, with the brash and truly entertaining cockney accent , is the winner of the cast as she cashes in by being coaxed repeatedly to pretend to be different players in the twisted schemes of deceit, orchestrated by the cheating lovers to keep their lies intact and everyone’s temper at bay. The cast did an amazing and professional job but, Robert and Suzette won my heart with their animated expressions and difficult tongue twisting monologues. Don’t dress for dinner was a truly hilarious lesson of what a tangled web we weave when first we practice to deceive. If you haven’t gotten tickets yet you still have time what are you waiting for, It plays though September 11th, 2016. 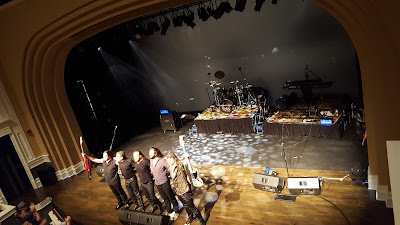 Departure, the Journey Tribute Band, returned to the stage for the 3rd time and magically sent its audience well those over say 40+ back to the late 70s early 80’s for the 3rd time at The Buford Community Center, Friday August 27th, 2016. Although, there were a few millennial and younger who danced and swayed in the theatre, a majority of the audience knew every word to every song. I realize that because I am true Journey fan my review could be somewhat subjective. Journey was, in fact my favorite band in high school. I played their albums over and over again, turned the radio up when their tunes come on and am not ashamed to admit, have the Escape CD in my car and still play it regularly. I will for the sake of professional journalism remain objective, yet will also say I set my Journey tribute band standards particularly high. It would be an understatement to simply say Departure was not a disappointment, with eyes closed you weren’t simply transported, Departure is the musical essence of Journey. I wasn’t the only one transported back. The audience participation was complete with cell phone flash lights that apparently touched the members of the band who recorded us waving to “O Sherry with lights out and cell phone flashlights on. A far cry from our lighter from the 80’s but still honored the joy the band gave to us. 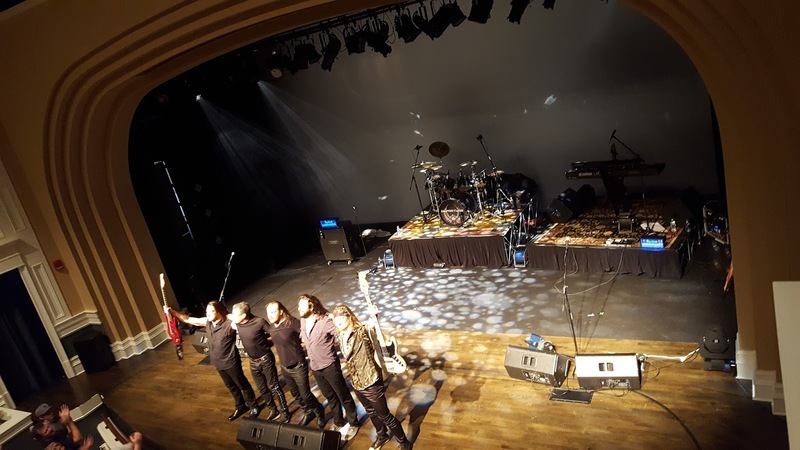 The band who have been perfecting their craft for the last 9 years together, took the stage and the Journey transformation was almost immediate, not attempting to be Journey look a likes the band definitely took on the look and feel of rock bands from the era. Lead vocalist Bryan Williams with waist length long hair sporting white tails with his jeans and black T-Shirt. Keyboard player Joel’s long 80’s rock band esque wavy tresses began blowing wildly from a fan under his keyboard as he stepped onto his pedestal creating a true rock band feel started the show with; Anyway You Want It, other songs included; Be Alright Without You, Steve Perry’s Foolish Heart, Wheel in the Sky with keyboard player Joel taking over the leads on guitar. 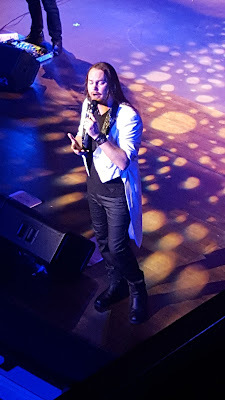 Lead Vocalist Bryan Williams has true stage charisma. Engaging regularly with the audience stepping across the side boxes like steps tapping heads and twirling the ladies in the audience on the first row. The entire band was entertaining to watch and although unique were the essence of Journey and many rock bands of the era. Williams , lead the ladies in a friendly woo hoo contest, against the upper balcony and ground floor as the band honored the ladies with their rendition of Girls Can’t Help It. By the time, they announced their last song the audience of course true children of the 70’s and 80’s, whistled and cheered until Departure returned to the stage with our favorite Journey encore songs including Open Arms, Stone in Love, Faithfully and finally ending with Separate Ways. We know this 3rd performance in Buford won’t be their last. Get your tickets early when they do because they always sell out quickly.